This dialog is opened by clicking on its related item in The Map Menu. 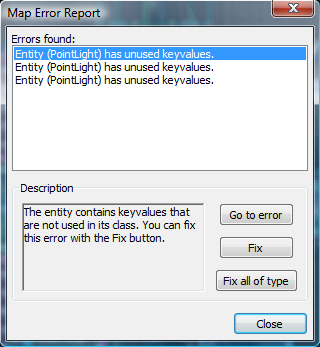 It checks the map for errors and shows them in an error report list. Errors found: The list of errors found in the map. Description: Detailed description of the currently selected error. Go to error: Centers the selected error in the views. Fix: Fixes the selected error. Fix all of type: Fixes all errors of the same type as the selected error.